She Builds Her Home: So...What Exactly ARE You Paying For? Adoption is expensive. You probably already know that. Most people know it is expensive, but I have found that most people don't realize just HOW costly, or what exactly those costs are for. Majority of people get that you aren't "buying a baby" but there is definitely a lot of confusion about where $30,000+ is going. And rightly so! I wanted to try to break down some of the costs of adoption so you can better understand the process and help spread the word. 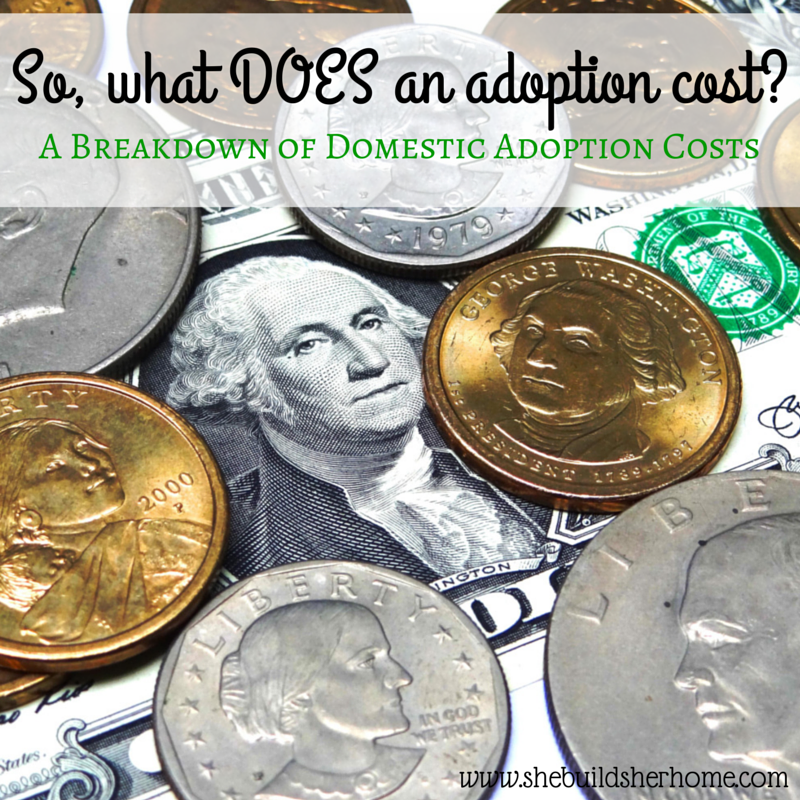 I have heard too many people saying how "unfair" it is that adoption costs so much. Of course we would love to not have to come up with this kind of money, but once you realize how many people this involves and what you are paying those people for, it makes a little bit more sense and seems a little less unfair. We want the whole process to be ethical and make sure everyone is being taken care of and that means a costly process. Please note that these numbers are average and could be more or less in reality. Homestudy Fee: $1,000-$2,500 Agency Fees: $15,000-$30,000+ (This is for application fees, paperwork, matching you with a birth mother, and sometimes covers birth mother expenses and counseling. The agency also takes care of all of those minor details like putting you in touch with the birth family if need be, notifying you when the baby is coming, supporting you and the birth family post birth, etc.). Attorney Fees: $2,000-$4,000 (You need an attorney to finalize the adoption of your child). Birth mother expenses/counseling: $1,000-$5000+ (This may include living expense such as food, rent, transportation, etc. This is often included in the agency fee). Medical Expenses: $1,000-$10,000+ (Depending on your insurance and the birth mother's insurance) Travel Expenses: $2,000-$3,000 (If your baby is not born in the state where you reside you will need to travel to the state the baby is born. Of course this will include gas or airplane tickets, hotel stay for a week +, etc.) Other Expenses: $1,000-$5,000 (Other paper work that may not have been included, printing profile books, applying for and mailing grant applications, using a consultant, etc.) Hopefully this break down helps you to understand where all of this money is going. It definitely takes a village to successfully pursue an ethical adoption but it is worth it in the end. Majority of families that we have talked with have said their adoptions costed $30,000-$40,000 so that is what we are expecting to pay as well. We have had several friends suggest that we start a crowd funding page to spread the word about our adoption. Sometimes random strangers can stumble upon these and your story may touch their heart. This is an easy way for friends and family to share on their social media pages and get the word out. We are so grateful to everyone who has already given to our adoption. We certainly don't expect anything from anyone, but every cent that we have received has been such a blessing. I really wanted to share more about the adoption costs because I know this question is often at the back of people's minds when they are feeling led to give. They want to know exactly what they are giving to. I hope this helps, and you can always let me know if you have any questions. If you feel led to give or share, you can view our profile on YouCaring. Thank you for praying for us, our future baby and their birth family.